Elton John certainly felt the love at Prince Harry and Meghan Markle's royal wedding this past May. 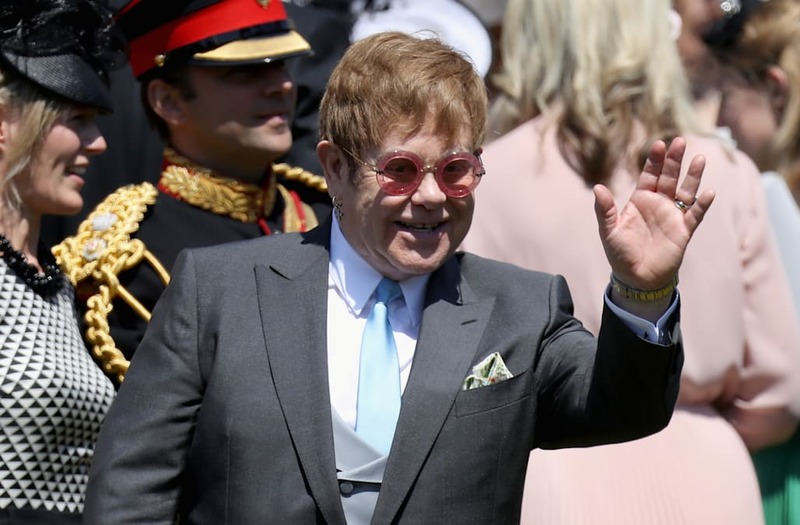 The 71-year-old veteran performer attended the historic event in Windsor, England, and even played a few songs at the groom's request during one of the couple’s receptions. John noted the fact that the late Princess Margaret had been forbidden from marrying the man she originally wanted to be with simply because he was divorced, noting just how far the monarchy has come since then. Prince Harry and Meghan Markle leave after taking part in a International Women's Day event during a visit to Millennium Point in Birmingham. Prince Harry and Meghan Markle on a walkabout during a visit to Millennium Point in Birmingham, as part of the latest leg in the regional tours the couple are undertaking in the run-up to their May wedding. Prince Harry and Meghan Markle meet members of the public during a visit to Millennium Point in Birmingham. Prince Harry and Meghan Markle hold each other during a walkabout at Edinburgh Castle on the couple's first official visit to Scotland on February 13, 2018. Prince Harry and Meghan Markle during a reception for young people at the Palace of Holyroodhouse, in Edinburgh, during their visit to Scotland. Prince Harry and Meghan Markle outside Social Bite in Edinburgh, during their visit to Scotland. Prince Harry and Meghan Markle at Edinburgh Castle, during their visit to Scotland. Prince Harry and Meghan Markle, attending their first official engagement together, arrive at the Endeavour Fund Awards at Goldsmiths' Hall in London on February 01, 2018. Ms. Markle wore a dark Alexander McQueen trouser suit and white shirt for the occasion. Prince Harry and Meghan Markle arrive for a visit to the Eikon Exhibition Centre in Lisburn where they attended an event to mark the second year of youth-led peace-building initiative Amazing the Space. John and Furnish recently joined forces with Prince Harry at the AIDS Conference in Amsterdam, Netherlands. Marcus Mumford and Carey Mulligan arrive at St George's Chapel at Windsor Castle for the wedding of Meghan Markle and Prince Harry. Doria Ragland, mother of the bride, outside St George's Chapel in Windsor Castle after the wedding of Prince Harry and Meghan Markle.